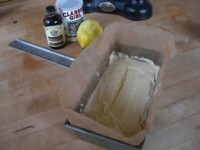 Line a 1lb loaf pan with buttered parchment paper. Beat the butter and the sugar together until light and fluffy. Add the eggs one by one, beating between each addition. Beat in the lemon zest and vanilla. Sift in the flour and the baking powder and mix until just combined. Put the batter in the lined loaf pan and bake in the center of the oven for 50 minutes to 1 hour. The cake will be golden brown and firm to the touch and a skewer will come out clean. 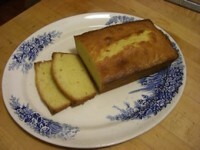 Remove the cake to a cooling tray and turn out of the pan. Poke the top of the cake all over with skewer to allow the lemon juice and sugar mixture to penetrate the cake. 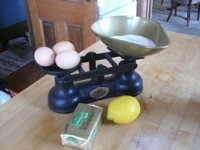 Mix the lemon juice and sugar together and spoon about a third of this mixture over the hot cake. Turn cake over and poke the bottom of the cake with the skewer and spoon another third of the lemon juice and sugar over the bottom. Turn it right side up again and spoon the remaining mixture over the top.